Dynamic EMS hosted a supplier day on Tuesday 16th May, at the company’s manufacturing headquarters in Dalgety Bay, Fife, Scotland. The event brought together top executives from Dynamic EMS and representatives from the company’s main distribution partners to discuss issues in the industry, and look to improve the overall efficiency of the supply chain. To ensure visibility over the whole supply chain, the company invited representatives from broadline, catalogue, and specialist distributors, as well as service providers and suppliers of mechanical products. Companies attending included Digi-Key, Avnet Abacus, Arrow Electronics, Rutronik, Farnell element14, Future Electronics, Rebound Electronics and America II Europe. The day was kicked off by Dynamic EMS Managing Director and Owner, John Dignan, who outlined the strategy and growth plans implemented since his takeover in 2014 and provided a progress report. He stressed the importance of the supply chain to the company and as part of the transparent culture he is trying to foster, inviting the attendees to contact anyone necessary in the company, whenever required. The remainder of the event was led by Supply Chain Manager, Paul Freeman, who ran through the current situation at the company and discussed opportunities and issues in the marketplace that could affect business in the near to midterm future. Subjects covered included supporting the company’s growth plans, rising prices, the challenges to the supply chain from Brexit, currency fluctuations, and manufacturer’s decreasing inventory levels which could possibly lead to distributors reintroducing allocation. Then Paul looked at the supply chain and how it was changing and iterated that both Dynamic EMS and its supply chain partners needed to adapt together to prosper, and the best way to achieve this aim was to share best practices and form even closer relationships. This is the third time the Dynamic EMS has brought its supply chain partners together. After the previous two occasions, the company has investigated all suggestions from its partners and implemented solutions based on these suggestions whenever possible. Freeman detailed some examples of these solutions during his presentation. These included Digi-Key helping to make stock easier to buy by guaranteeing prices for regular orders, and Farnell element14 assisting the company to move to an electronic invoicing solution. To capture the day’s proceedings, the Dynamic EMS team shot a short three-minute video. 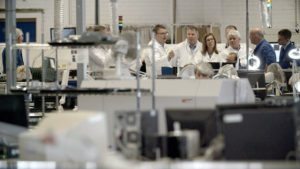 This video delivers key messages from John Dignan, Managing Director and Owner of Dynamic EMS, Paul Freeman, Supply Chain Manager, Dynamic EMS and, Marian McAloon, Strategic Account Manager, Future Electronics. Click here to watch. This entry was posted in Contract Manufacturing, Contract Manufacturing, Europe, Global, On Ticker, top articles, UK. Bookmark the permalink.